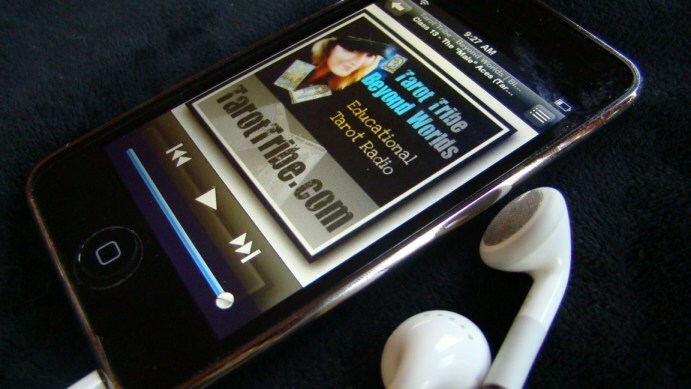 We feature several ways to listen, all free to download, both for live and archived classes. 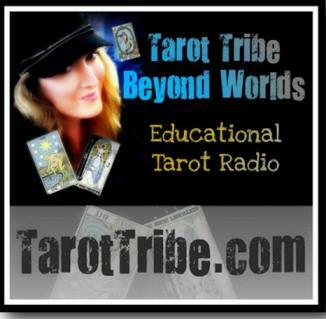 you can listen to our free tarot classes. 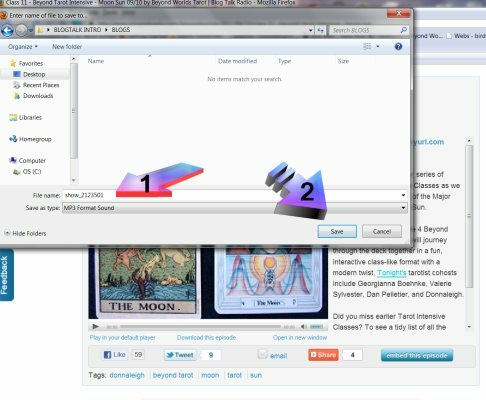 Join our friendly chat room and meet and interact with other tarot enthusiasts while learning about tarot! 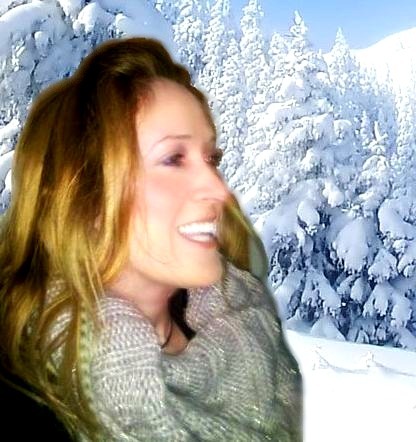 Before joining us in the chat for the first time, set up a free Blogtalk account (www.blogtalkradio.com) and give yourself a name for the chat room. It takes less than a minute to do, and there is no spam. About 5 minutes before the show you will see a chat room under the large show picture that loads automatically when you go to the individual show's page link. If you are logged in under your account, you can start chatting with us! Once the show starts airing, you will at the same time hear the show; be sure your computer volume is on. You can listen to us in the car or when shopping or walking by calling our New York City based studio line: (646) 200-0765. As soon as the show goes live, you'll hear us right on the phone. You can pop in your Blue Tooth and shop with us! Archives can be heard by phone if you have a smart phone. Go to the show pages in your web browser, as explained in the web directions below. 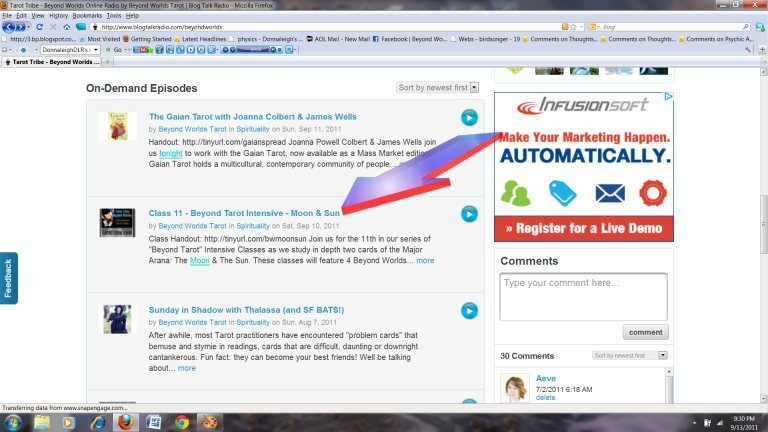 The audio should auto-start once you are on the page after a brief advertisement. There is a convenient play/pause button under the picture. Handout URL's are listed at the top of each show page. by clicking on an episode title below, and then pushing the "play" or "pause" button to start and stop the class. 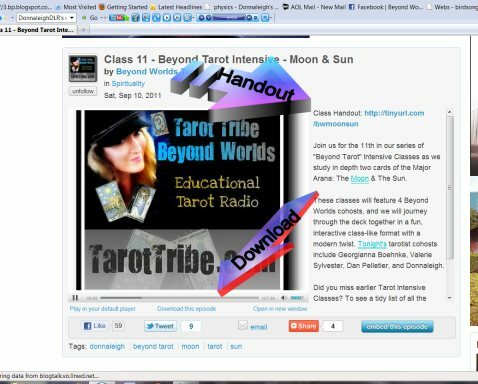 Type "Tarot Tribe" or "Beyond Worlds"
and choose your favorite classes to download. *(Optional: for a complete list of archived episodes organized on one page, CLICK HERE. 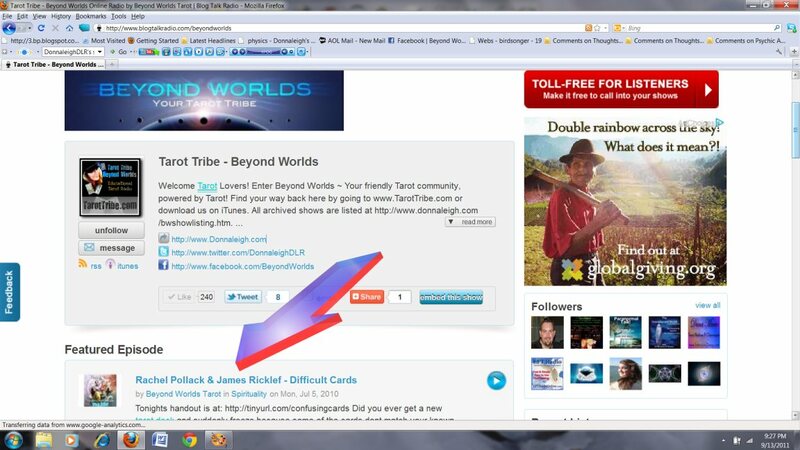 Clicking there will lead to links that go directly to the episode). Once you have finished clicking on the title, you will land on the page of the very episode you want. 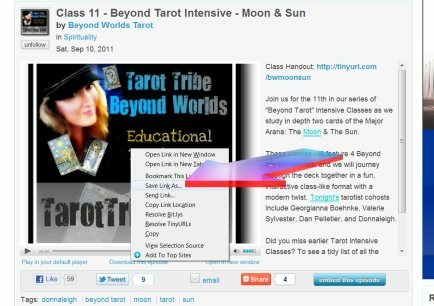 At the top of episode pages, many offer a handy URL to a show hand-out for class visuals. LEFT CLICK on "Save Link As" and a box (below) will come up to allow you to save the episode to your computer or Flash Drive. Title it as you wish in the text box (#1 arrow below) , and remember where you put it; as you can then copy and paste it into your MP3 Player. 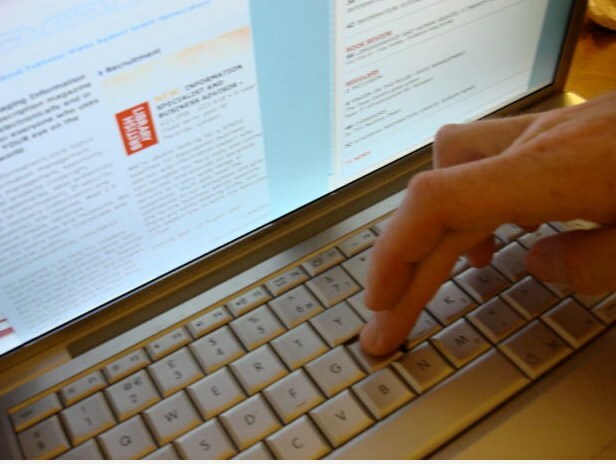 Left click on SAVE (#2 arrow below).